Bonnie and Clyde may be the most notorious--and celebrated--outlaw couple America has ever known. This is the true story of how they got that way. Bonnie and Clyde: we've been on a first name basis with them for almost a hundred years. Immortalized in movies, songs, and pop culture references, they are remembered mostly for their storied romance and tragic deaths. But what was life really like for Clyde Barrow and Bonnie Parker in the early 1930s? How did two dirt-poor teens from west Texas morph from vicious outlaws to legendary couple? And why? I found this book to be a compelling tale of two people who made some really bad decisions that lead eventually to their deaths. I'd heard of Bonnie and Clyde before, who hasn't? But I knew very little about them. This book answered many of my questions. Did it answer all of my questions? No, but then again no book can do that seeing as their is no way to completely know and understand Bonnie and Clyde's motivations. 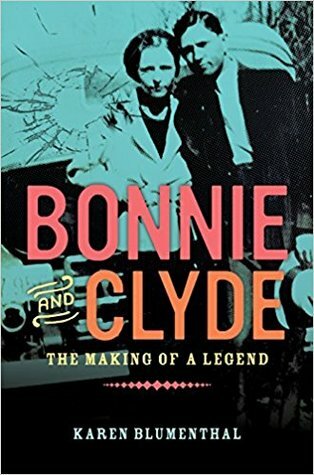 Blumenthal does an excellent job though of giving as clear a picture as possible of what is known (or thought to be known) about Clyde and Bonnie and what led them to become legends. Frankly, I found the story a rather sad one as Clyde and Bonnie made poor decision after poor decision that effected not only themselves, but their families and friends as well. It started as many such stories do with Clyde getting in trouble as a youth. His family's poverty undoubtedly had at least something to do with that in addition to the friends he spent time around. Unfortunately for Bonnie, her life changed forever once she met Clyde. Her unwillingness to walk away from him after he went back to a life of crime led her to her death. After reading about the shocking number of people they killed and the number of shootouts and robberies they were involved in (and there may have been more) I began to understand why these two became so famous. What boggled my mind is the end of the book where the author explains how people responded to Clyde and Bonnie. The thousands of people that wanted to see their dead bodies. The number of newspaper articles about them, the movies made, and books written. These two criminals received more attention than all of their victims put together. A sad commentary on American society is the fact that these two are still so famous yet their victims have been all but forgotten. I wasn't able to get this book, so just read the 40 page preview on Amazon. I am glad you thought this book was worth the read.